BlueFolder's service management solution offers a unique blend of ease-of-use and functionality. 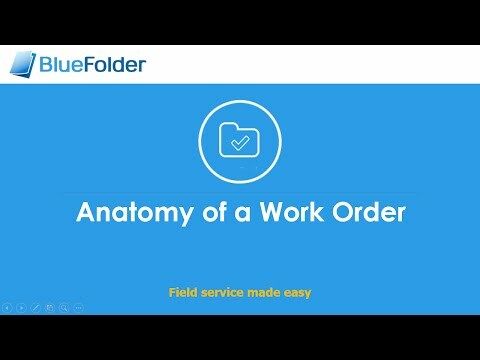 Think of BlueFolder as CRM + Work Orders + Scheduling + Billing. BlueFolder's CRM functionality allows users to track all service-related information for their customers – contacts, locations, service history, contracts, and equipment/assets that are serviced at their site. Work Orders are where the work gets done, and we give you the ability to customize the fields that you use and add attachments as needed for your business. The work orders track all of the labor, materials, and expenses and you can easily push these details to your accounting system for accurate and timely billing. We support integration with QuickBooks, QuickBooks Online and Xero. Customer interaction is a critical part of effective service. Customers can request service not just by calling, but by sending an email to the system or using the customer portal. With BlueFolder, customers can log-in to their accounts, open new work orders, see the status of existing ones, or provide additional information. They can also be notified automatically via an email of updates or changes, if this option is selected. BlueFolder has been reliably providing a service management solution to businesses for over 10 years, and have customers who have used the system to run their service business from the beginning. The software is easy to use and has some great functions. The best feature is being able to sort by job, property, etc. I LOVE having the search bar - I use this every time I enter a new service request. It helps being able to go back and see all the jobs for a specific property - or even all the jobs with one specific issue. It's easy to look up past work orders (so I can see when something has been previously done with a property). It's very simple to set up new properties and contacts. The invoices are very professional looking and transfer nicely to QuickBooks. I have been a user of Blue Folder since 2009. I have always kept an eye out for other applications to make sure I was get the best bang for my buck. I have spent hundreds of hours testing other systems and I can tell you this app is the only one that makes it easy and a very short learning period on how to use the app. The best feature they have is the customer notifications. That alone is worth the price. They make it so easy to communicate to my customer and they tell me that they love it!! Our customers are aware of what is going on every step of the way.Customer Notifications Ease of use Very pleasing to look at The customer support team treats me like a family member and not just another customer. The get customer service beyond just being there when needed. Customer Notifications Ease of use Very pleasing to look at The customer support team treats me like a family member and not just another customer. The get customer service beyond just being there when needed. I would consider Blue Folder to be a "pillar" of our business. It is as important has as our accountant, lawyer, sales team, support team, etc. I do not think we could operate without it.I like how the software is updated on a monthly basis and updates are distributed automatically. Improvement suggestions are encouraged and often make it into a future update. Uptime is 99.9%. All data is automatically backed up online. I really like how you can search the service call titles and the comments. This makes it easy to find a solution to a problem we have dealt with before. We also like the mobile edition on our Android phones. The technicians are automatically alerted to schedule changes and can easily lookup maps, driving directions, gate codes, special instructions, etc. However, the best feature is that the software is focused on service businesses, which means that the interface is simple, yet powerful. It saves us many hours over the old way we managed our service team. For Customers, Work Orders, Assets, etc. •	BlueFolder streamlines service businesses enabling them to keep track of everything and be sure that nothing falls through the cracks. •	Accounting integration. BlueFolder's integration with QuickBooks, QuickBooks Online, and Xero will make it easy to get detailed invoices to customers without re-entering all that information. Get paid faster and don’t miss an invoice. •	Month-to-month subscription – no long-term commitment required – cancel anytime. •	Customer support – along with a Help Center, BlueFolder's support team is available by email and phone. Below are some frequently asked questions for BlueFolder. Q. What type of pricing plans does BlueFolder offer? Q. Who are the typical users of BlueFolder? Q. What languages does BlueFolder support? Q. Does BlueFolder support mobile devices? Q. Does BlueFolder offer an API? Yes, BlueFolder has an API available for use. Q. What other apps does BlueFolder integrate with? Q. What level of support does BlueFolder offer? Q. Which apps is BlueFolder compared to most often?